One might think the real push to remove God from the classrooms of America began in 1963 with the lawsuit to remove prayer from schools filed by Madalyn Murray O’Hair against the school board of Baltimore. Not even close. In 1837, Horace Mann became the first secretary of the Massachusetts Board of Education, which was the first board of education established in the United States. This was the first major step in removing schools from the influence and control of families, parents, churches, and local communities and placing them in the control of state government. Although state-run schools allowed children from all classes and backgrounds to receive an education and provided needed funds for learning materials, Mann immediately began pushing for the removal of religious sectarian instruction in class. Once considered brilliant education reformers of their time, men like Horace Mann, John Dewey and G. Stanley Hall are still considered brilliant education reformers — among progressives, that is. They believed they could bring about social change and a democratic society through education. Dewey claimed that democracy is the frame of reference for education. G. Stanley Hall based his studies of childhood development on the theory of evolution and so began the segregation of children in the classroom based on their position on the evolutionary scale. Hall believed children should be indoctrinated to save them from the individualism that he believed was damaging to the progress of American culture. In a video interview with Doug Phillips on education in America, John Dewey is described as a radical secular humanist, a bonafied God hater, and an atheist. Humanism continues to be a foundation of progressive education today. The work of removing God from schools continues in thousands of schools across America under the model and ideas of Dewey and other radical progressive educators and psychologists. 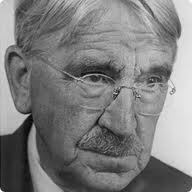 John Dewey aided in drafting the first Humanist Manifesto in 1933, which was written with the purpose of creating a new religion, humanism. The manifesto states that “… man’s larger understanding of the universe… requires a new statement of the means and purposes of religion”. The goals of humanists, according to the 1933 manifesto, included the evaluation, transformation and control of all associations and institutions, including the reconstitution of “religious institutions, their ritualistic forms, ecclesiastical methods, and communal activities”. President Obama and Bill Ayers have a much more extensive relationship, especially with regard to education, than most people realize. They share the same humanistic view of education and social order. Read here about President Obama’s deep involvement, even today, with a secular humanist education reform movement that now operates in thousands of schools nationwide.